A trader’s worst enemy is subjectivity. As humans we have intuition, feelings, and hopes, but when we allow those to influence our trading decisions it often leads to failed trades. That’s why it’s critical to use the systems and indicators that give us discrete entries and exits that allow us to trade what we see – not what we feel. The Moving Average Convergence Divergence (MACD) indicator was invented by Gerald Appel in the late 1970s. It’s a great indicator for determining both changes in trend direction as well as trend strength. The MACD is constructed by calculating the difference between a short-term and a long-term exponential moving average (EMA) creating a MACD line. And then the MACD line is then plotted along a signal line (I’ll show you this in just a second). From there, reading the chart is simple. If the MACD line crosses below the signal line, its signaling a bearish trade and if the MACD signal crosses above the line, you’re looking at a bullish setup. Typically, the MACD line is calculated using a 12-day short-term EMA and a 26-day long-term EMA. The signal line is typically a 9-day EMA. The following MACD chart illustrates these settings with the MACD line colored blue and the signal line colored magenta. As you can see, a bearish cross is signaled when the blue (MACD) line crosses below the magenta (signal) line and vice versa. 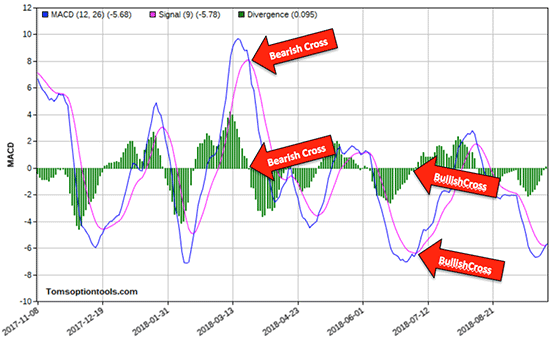 Another strength of this technical indicator is that you can determine the strength of trend by looking at how quickly the MACD line is moving away from the signal line. If there’s more space between the two it signals a stronger trend. But if you’re looking for a simpler way to view the MACD – no worries, a histogram is what you need. In the MACD chart above, the histogram is depicted as green bars extended above and below the zero line. When the histogram moves above the zero line, we have a bullish cross. When the histogram drops below the zero line, we have a bearish cross. And the strength of trend is determined by the size of the histogram. So, now that we have broken down this indicator, let’s take a look at how well it predicts direction on an actual chart. Below is a chart of Lam Research (LRCX) along with its MACD chart. The green vertical lines signify a bullish cross and the red vertical lines a bearish cross. You’ll also notice that the MACD/signal line crosses correspond with the MACD histogram crosses. In all but a few cases, the crosses all led to a significant short-term move in the direction that the cross indicated. You can use MACD to get into and out of your trades early. 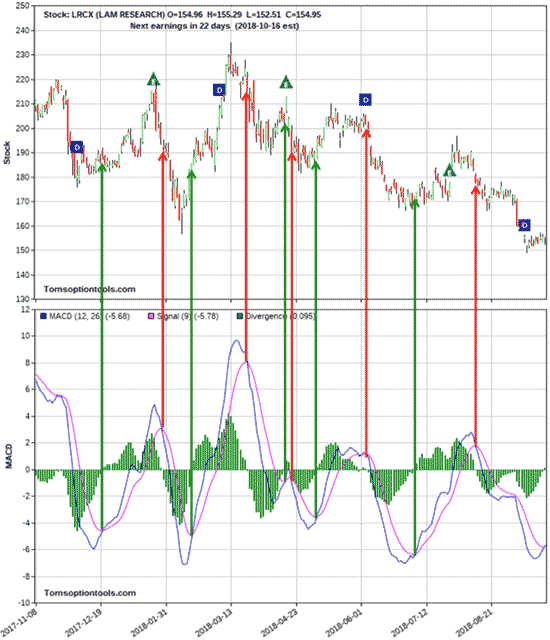 If the MACD line crosses above or below the zero line, it could mean a trend or reversal is forming (this will be confirmed later by the Signal line crossing the zero line). Likewise, if the MACD line crosses the signal line, it could be an even earlier indication of a reversal. The downside to MACD is it doesn’t tell you how much a stock will move, or in what timeframe. Consider using MACD in conjunction with other technical indicators rather than the sole means of picking your trades. Use a tight trailing stop (5% on stock, 25% on options). Exit bullish trade with a close < 10-day MA. Exit bearish trade with a close > 10-day MA. Although simple, MACD is an excellent indicator that provides accuracy as well as frequent trading opportunities. In fact, next on my radar is a lightning-fast move designed to hand you 100% gains in four days or less. This trade recommendation launches Thursday – so if you want to learn more, you must start here now. Now, before I go, I want to make sure you’re aware of the biggest event we’ve had here at Money Map Press to date. Tomorrow at 8 p.m., you’re going to hear from the most talented strategist to ever walk the earth… one who, in the last five years, has generated 32 consecutive wins and hasn’t taken a loss on a SINGLE trade. But nearly 24,000 of our readers have registered to see this undefeated strategy. But you must register now. Knowing how private Tim is, I believe he could pull this offline with no warning. Don’t miss this. Is There Any Value In OGX’s Shares?